As the playoffs approach there’s been a lot of talk of the 2008 Chicago Cubs, the class of the National League, and of the 1908 Chicago Cubs, the last team in franchise history to win a World Series, and of certain disappointing Cubs teams from the century of waiting between Johnny Evers and Ryan Theriot, such as the 1969 Cubs and the 1984 Cubs and the 1989 Cubs and the 2003 Cubs. Lost in the litany of Cubs teams that Did Not Win It All is the 1979 Cubs, who nearly perfected mediocrity but ultimately failed at that, too, just barely, losing their final game of the season to finish 80 and 82 instead of 81 and 81, with 706 total runs scored and 707 allowed. History tends to shuck such inconsequentialities, which saddens me. Maybe it’s my purpose in life to push back against the obliterating tide. I don’t know. But I do know that the 1979 Cubs deserve to be remembered because, if nothing else, they set the all-time single season record for nostrils. The Cubs’ Gehrig-Ruth combo in nostrilness, shown above, came together in midseason with the acquisition of Doug Capilla, who became to the pitching staff what Steve Ontiveros had already been to the everyday players: someone capable of moving staggering quantities of oxygen and carbon dioxide, respectively, into and out of his nose. Cubs management may have been motivated to make the move by the strong play in the 1979 season of the Pittsburgh Pirates, whose alert, inspired, electrifying play and ebullient disco-laced camaraderie have been associated with and even partially explained by their ingestion via nasal canals of prodigious amounts of cocaine; Cubs brass may have reasoned that to compete with the Pirates they needed to get more “oomph” running through the bloodlines of their sluggish, lackluster squad, and saw the giant-nostrilled Doug Capilla as the means to this end. It’s not enough for me to end here, however, with this tribute to one of history’s forgotten collective achievements. I find myself wondering about Steve Ontiveros, who is like a forgotten entity within a forgotten entity. Not only is the 1979 Cubs’ nostril record uncelebrated, but the man who laid the foundation for the record, who brought his sizable nostrils to the ballyard every day, was likely cast aside by the Windy City’s top nostril groupies as soon as the massive twin circular canyons in the middle of Doug Capilla’s face hit town. Worse, once Capilla took center stage on the team, Ontiveros became expendable, playing 31 games the following season before being released on June 24. He did not play major league baseball again. But in 1985 Steve Ontiveros debuted as an Oakland A’s reliever, only it wasn’t the Steve Ontiveros shown here. It was a different Steve Ontiveros. When you type the search terms “Steve Ontiveros” into Google, the first listing is for a page on baseball-reference.com. It is for the second Steve Ontiveros. In that way, the first Steve Ontiveros has been usurped once again, paved over by history. I’ve seen this kind of thing before while writing about my childhood baseball cards, seen guys named Dave Johnson and Dave Roberts dissolve into other guys named Dave Johnson and Dave Roberts. But, as names, Dave Johnson and Dave Roberts seem much more generic to me than Steve Ontiveros. I mean, I’ve lived a few decades and lived in two big cities and read a lot and I’ve never met or heard of anyone with Ontiveros as a last name. Are there two Kurt Bevacquas? Are there two Biff Pocorobas? 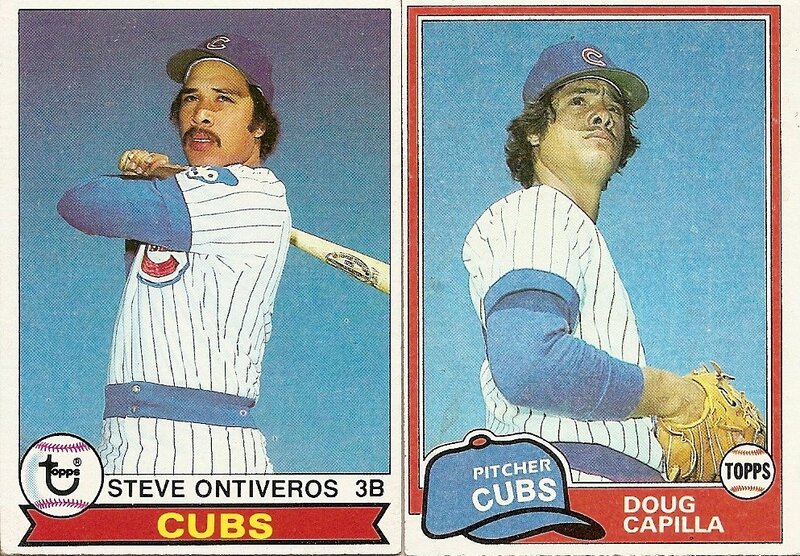 Why must there be more than one Steve Ontiveros? I don’t know. But my disillusionment in this matter reminds me of when I was a kid and discovered that there was not just one Ray’s Pizza in New York but dozens of Ray’s Pizzas. This shook me up a little. Every summer, my brother and I would come down from Vermont and see our father in Manhattan, and our visit would always include at least one trip to Ray’s Pizza on Sixth Avenue and 11th Street, just a couple blocks from Dad’s apartment. It was, I believed, the best pizza that has ever been made. As I remember it, there were times when the line for their giant cheesy slices was out onto the street, as if a piece of Ray’s was perpetually like a smash hit on Broadway. At some point, probably during solo visits from boarding school or college, when long pot-driven walks took me on my own through the city for the first time, I started seeing places that called themselves Ray’s Pizza everywhere. Worse, many of them claimed to be “The Famous Ray’s Pizza” or “The Original Ray’s Pizza” or even “The Famous Original Ray’s Pizza.” Being that I was still the kind of neophyte pot enthusiast who “got the munchies” I occasionally found myself far from the village and hungry, and, feeling traitorous, I was forced to patronize some of these imposters, their uninspired triangular groupings of crust, sauce, and cheese always confirming my belief that there was only one Ray’s Pizza, and it was the one my father had taken me to. I of course don’t actually know which Ray’s Pizza came first; they don’t have their histories printed on handbills near the napkins and hot pepper shakers. But I know emotionally, and it galls me, a little. Why must there be more than one Ray’s Pizza? Which brings us back to Cardboard Gods. As I mentioned earlier in this series, I started Cardboard Gods a little over two years ago with some words on Mark Fidrych. Before that posting I had come up with the name and had typed the two words into Google to see if anyone else had beaten me to it. A handful of listings came up, but none of them had anything to do with baseball or baseball cards, so I had a name for my endeavor. If you type those two words into Google now you’ll find listings that differ quite a bit from the sparse listings I found back in the summer of 2006. I’m not encouraging anyone to perform such a search. Why would you? But if you do ever happen to find yourself wandering around and wondering about Cardboard Gods, I just wanted to get it down in writing that this is the original Cardboard Gods. The one that was here first. The one with the extra cheese. The one with the record-breaking nostrils. You are currently browsing the archives for the Steve Ontiveros category.